Have you ever woken up from a night of intense dreaming and not been able to remember much of anything about the dream? Well that’s not what I’m talking about at all! I’m talking about your dreams forgetting you! Those things that you want to have in your life: a goal, a person, an item or anything else you can imagine. It started as an image in your head. Then you took some form of action to make it a reality. You might have even got close. But then it was gone. Sorry to say, your dreams have amnesia! Your dreams don’t know who you are and don’t care about you in the beginning. Like the most popular girl in high school, your dreams could not pick you out of a line up. What’s worse is that your dreams have a form of amnesia. You can walk up and introduce yourself but the next day you’ll be forgotten. Just like Adam Sandler in the movie “50 First Dates”. You need to recognize this condition and not take it personally. DO THE WORK! The only way for your dreams to remember you and begin to accept you is through constant contact. Don’t let a day go by that you’re not courting, coaxing and down right harassing your dreams (the last one doesn’t work well with people). It won’t happen overnight! I can’t even tell you how long it will take but if you’re consistent daily, hourly and minutely (is that a word?). You’ll find yourself getting closer to your dreams. Maybe one day they’ll welcome you with open arms. Unfortunately that’s going to take a lot of work first. Dream big and make yourself memorable! Someday is a great concept with an infinite amount of possibility. “Someday I’ll get that new car. Someday I’ll meet that special someone. Someday we’ll get that bigger house. Someday I’ll feel better about myself.” The problem with someday is that it is like a ship floating off in the distance. The only way to get someday to come is to lasso it, anchor it to the spot where you stand and pull it in. Today is all that we ever truly have. So if we want someday to eventually become today, we need to connect the two. I don’t know what your someday dream is but it will probably require a lot of pulling. Each and every day you need to do something to get you closer to that someday. At times it will seem like you’re making no progress. It may seem like it is impossible. Then you’ll find out which is more important: wasting today or using it to turn it into someday. 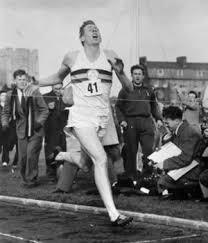 On May 6th in 1954, Roger Bannister broke the World Record for running the mile. He was the first man to run one mile in under four minutes. Many runners had attempted the run but all had failed until Bannister. Although he is remembered for “breaking” something, I contend that what he created was much more important: possibility. The key to Bannister’s run is that he opened the door of possibility for other people to do the same*. He pushed the edge of what humans were capable of doing. All it takes is one person to show us that our limits are not what we thought they were. Lindberg, Edison, Robinson and countless others swept aside the past to show a brighter future with fewer limits. It seems to be the natural order of things that when the bar is raised, we rise to the occasion to meet it. From my own life, I know that my father was the first in his family to go to college. It is no longer a novelty. All of my brothers and I attended college. The Bannister Effect could be found in many people’s lives. Is the difference between impossible and possible only a matter of time? How many people told Bannister he couldn’t before he did? How many people scoffed at Lindberg before he was cheered in Paris? How many people turned a blind eye to Edison before they saw the light? The critics will always be there and their ridicule of your dream will be true, until it’s not. In the end if you give up, they’ll have their “I told you so” moment and everyone will move on. If you persevere and triumph, they’ll stand silent and everyone will move up. I would love to see you rise up rather than give up. *Additional information: World Records for the mile date back to the 1850s. The time slowly and incrementally decreased over the next ninety years when Gunder Hägg of Sweden ran a 4:01.4. Then it took ten years before Bannister broke through the four-minute barrier. Six weeks later, Bannister’s record was broken. Today his time from 1954 is six seconds slower than the high school record for the mile.